Festival de la BD de Montréal! You'll also have the opportunity to meet some of Drawn & Quarterly's own artists, who will be on hand to sign books and chat. This year, we've got Guy Delisle, Julie Delporte, and Pascal Girard! Schedule below. 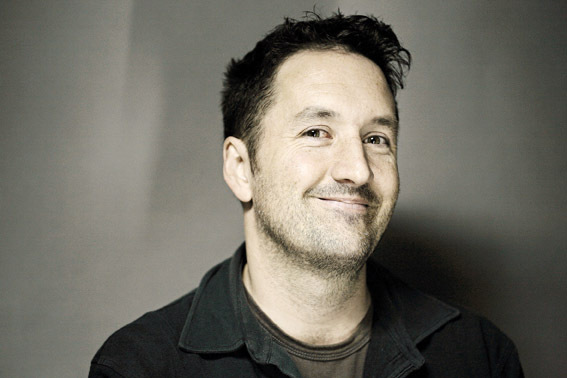 Guy Delisle (born January 19, 1966) is a cartoonist and animator from Quebec City, Quebec, Canada, best known for his graphic novels about his travels, such as Shenzhen (2000), Pyongyang (2003), Burma Chronicles (2007), and Jerusalem (2011). With his newest book, A User's Guide to Neglectful Parenting, Delisle takes a break from writing landmark, award-winning travelogues and brings us a collection of humourous, self-deprecating vignettes about the travails of fatherhood. 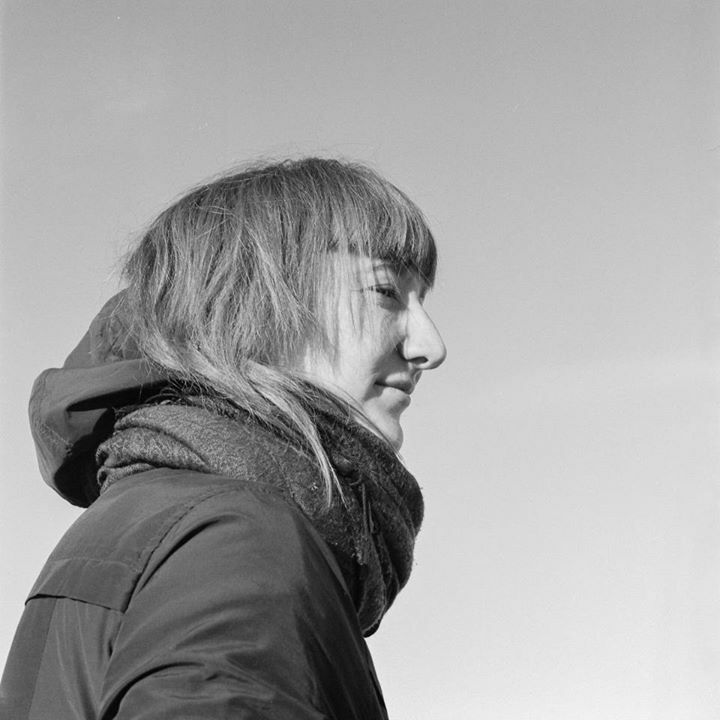 Born in Saint-Malo, France in 1983, Julie Delporte currently lives in Montreal where she publishes books and zines with the collective Colosse. In 2011 - 2012 she was a fellow at The Center for Cartoon Studies in White River Junction, Vermont. She has published a French children’s book (Je suis un raton laveur) about a little girl who turns into a raccoon, some short pieces at L'employé du Moi (Brussels) and in various anthologies. She also organized Montreal’s annual “48 Heures” comics festival and newsprint anthology, and runs the comics-centric francophone radio show “Dans ta Bulle." Color pencils and dogs with long ears are her favorite antidepressants. Her most recent book is Journal, a collection of her autobiographical webcomics from Koyama Press. A new book by Julie is forthcoming from Drawn & Quarterly next year! Pascal Girard was born in Jonquière in 1981. He began filling the margins of his notebooks with drawings from his first day of school. As he was never able to rid himself of this good habit he naturally decided to make it his career. He received his interdisciplinary Bachelor of Arts from the University of Quebec in Chicoutimi in 2004. 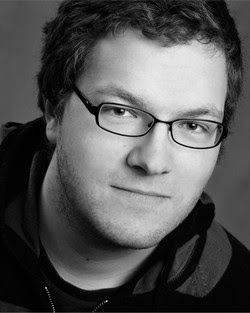 Since then he moved to Quebec City and currently divides his time between his illustration career and drawing comics. His first two books, Dans un cruchon and Nicolas, shared the Réal-Fillion prize at the Quebec Francophone Comics Festival in 2006. His most recent book is Reunion (2011), from Drawn & Quarterly. Ariol: Thunder Horse is here! This is the second book chronicling the everyday adventures of a delightful donkey named Ariol and his friends (first book is Ariol: Just a Donkey Like You and Me). These wonderful books, written by Emmanuel Guibert and illustrated by Marc Boutavant, are now finally available in English! I can't get enough of this hilarious little guy, so I was happy to see that Ariol: Happy as a Pig will be released this December! New comics from local artist Georgia Webber! Store friend and local comics artist Georgia Webber has made two gorgeous comics, DUMB #1 and DUMB #2. She started her DUMB project immediately after being diagnosed with a throat condition that left her unable to speak for six months. Check out this interview she did recently with The Bygone Bureau, where she talks about how she coped with forced silence, and about her creative process and inspirations. Come check them out. And then get excited for more installments - these are just the first two of a multi-part comic series! We just received a new D+Q book by Guy Delisle! With A User's Guide to Neglectful Parenting, Delisle takes a break from writing landmark, award-winning travelogues and brings us a collection of humourous, self-deprecating vignettes. Right in time for Fathers' Day, this new book offers wry solutions to the petty frustrations of being a dad who works from home. Compared to the original French edition, this one has pulpier paper and no dust-jacket which, if you insist on knowing my personal opinion on this matter, I think is nicer. Oh, Guy! Catch him next week in Montreal, on the occasion of the Festival BD de Montréal, where Guy has been invited as a special guest. He'll be signing at the festival everyday, and we'll have his books on hand at our table there! 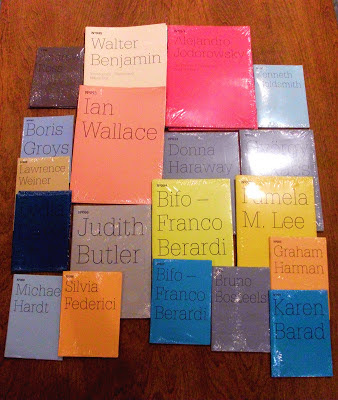 As part of our ongoing renovation of our art books section, we've just received a selection of books from the 100 Notes – 100 Thoughts series that art publisher Hatje Cantz issued as a companion to the Documenta (13) art fair in 2012. The series includes facsimiles of existing notebooks, commissioned essays, collaborations, and conversations from a wide range of contributors. We have some from philosophers (Walter Benjamin, Judith Butler, Donna Haraway, Michael Hardt, Silvia Federici, Graham Harman), artists (Ian Wallace, Lawrence Weiner), filmmakers (Alejandro Jodorowsky), poets (Kenneth Goldsmith), fiction writers (the recently-Booker-Prize-winning Lydia Davis) and art theorists (Boris Groys, Pamela M. Lee). Like the New Directions Pearls series or Penguin's Great Ideas, these little books are colourful, portable, affordable and eminently gift-able servings of ideas. Brain vitamins! Tonight! The Coming Envelope 7 launch, Friday, May 24th 7pm! Tonight! 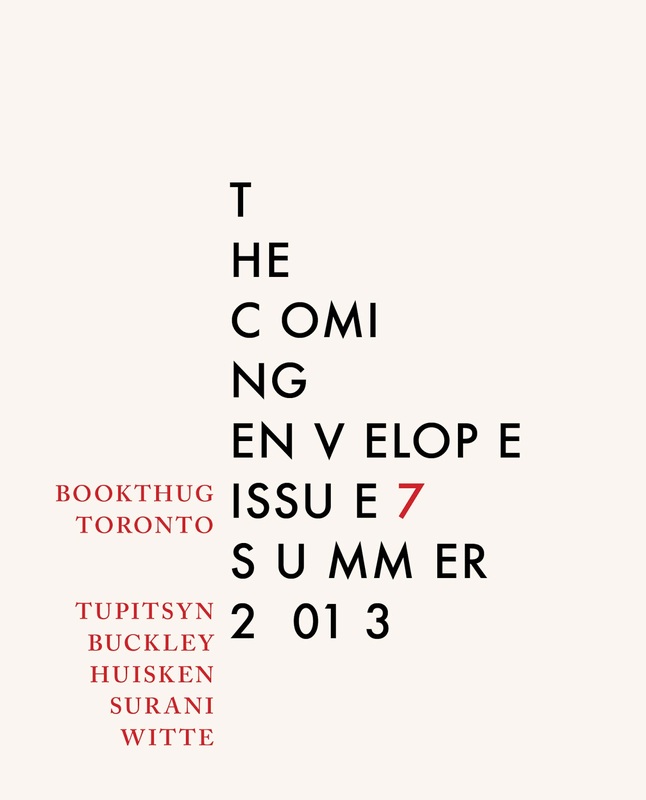 Friday, May 24th, at 7pm, we are happy to be hosting the launch for issue 7 of The Coming Envelope, BookThug Press’s journal of innovative prose, featuring new work by Masha Tupitsyn, Jesse Huisken, Kyle Buckley, Valerie Witte and Moez Surani. Our special guest Oisin Curran has lived in Montreal for the past seven years. He is the author of the amazing, little known, novel Mopus and this will be his last reading in Montreal for awhile. The evening will also feature a reading by writer and cultural critic Masha Tupitsyn. She is the author of LACONIA: 1,200 Tweets on Film (ZerO Books, 2011), Beauty Talk & Monsters, a collection of film-based stories (Semiotext(e) Press, 2007), and co-editor of the anthology Life As We Show It: Writing on Film (City Lights, 2009). Most recently she is the author of Love Dog (Penny-Ante Editions, 2013), an art book that is part love manifesto, part philosophical notebook, part digital liturgy. Tonight, 7pm, 211 Bernard Ouest! 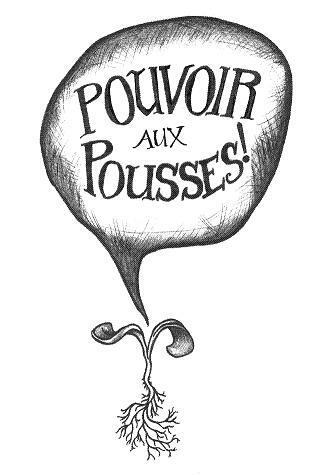 Today, Sprout Out Loud! 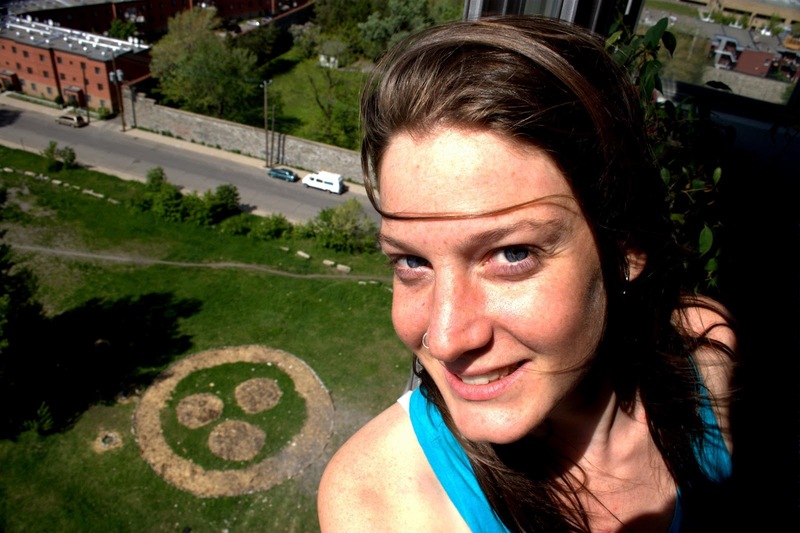 would like to introduce and celebrate their newest issue #2 with the Montreal public: Occupy the Streets with Land Art & Guerilla Gardening, with Emily Rose Michaud. Join us for a bilingual visual presentation on Guerilla Gardens and Land Art followed by hands-on planting! Sprout Out Loud’s second issue is a collection of community submissions by engaged artists, citizens, activists and gardeners from Canada and beyond. -empower others to plant similar ideas in their own environments where needed. This second issue includes submissions by Sean Martindale, Sara Torrie, Norman Nawrocki, Anne Goldenberg, Dominique Ferraton, Andrew Mckay, Kimberley Mok, Bruce Cawdron, Kendra Besanger, Matthew Bennett, Scott Duncan. This event is free & zines in both languages will be available for purchase. SPROUT OUT LOUD! is a project led by artist/organizer Emily Rose Michaud. You can learn more about Emily's Land Art projects, installations, academic and community outreach, classes and workshops on her website. Today, Wednesday, May 22nd at 211 Bernard Ouest! It's here, and bathed in white light, the best-selling and beloved "everyday life interiors" magazine, Apartamento! And issue No.11 has more of what we love, apartments and other homes that house creatives and their work. We also have a limited number of No. 10 left! Move in! Photos from Lisa Hanawalt and Michael Kupperman launch! Last week, we were graced by the hi-larious hijinks of New York City cartoonists Lisa Hanawalt and Michael Kupperman. They were here to launch their newest books: My Dirty Dumb Eyes and Tales Designed to Thrizzle, Vol. 2, respectively. Though you'd never confuse the two, both have a keen eye for skewering pop culture and colourfully sardonic artwork. And don't these covers go nicely together? Meant to be. Tracy, editor at D&Q, introduced our guests, making sure to issue a warning about the potential for pants being literally laughed off, just to be safe. Up first, Michael's delivery combined fast-punch gags and a 1950's announcer voice to complement his work's twisted take on old-school comic strips. Actually, Michael showcased a special knack for voices of all kinds: at this point, some attendees were briefly under the impression that Daniel Craig had snuck in the back, which was not the case! But it wasn't all fun and games and Skyfall parodies: Michael didn't shy away from asking the big questions. His presentation finished with a screening of this cartoon where Mark Twain cruises around on a raft made of garbage, which settled any questions about the intersection of comics and serious literature for good. Next up: D & Q's own Lisa and her irreproachable taste in shirts, reading from her vibrant new collection of comics and illustrations. No British actor was beyond lampoonery that night, no matter how popular with the ladies. This was from a excerpt of Lisa's illustrated movie review of War Horse, which went over extremely well even with an audience in which one lone gentleman admitted to having seen the film. More big questions were asked. And everyone learned a whole lot about wildlife, headgear, and the combination thereof. Though thoroughly pooped out from a long evening of belly laughs, our intrepid audience persevered through a lively signing. We have a bunch of signed copies here at the store, definitely come check them out! Paul Joins the Scouts ! Paul Joins the Scouts, the new English translation of Michel Rabagliati, is in store! Last week, Michel Rabagliati won the Doug Wright Award for best book, for The Song of Roland. Local talent Meghan Lands just dropped off her new comic, Shark Bite Capital of the World, and it's a steal at only three dollars. Get your copy now, before she's famous and the price goes up (or we run out)! Julie Delporte & Chihoi Launch: RECAP! This tuesday, we were delighted to be host the launch of Chihoi and Julie Delporte's books! Chihoi is a Hong Kong artist whose books have been published in Chinese, Italian and French and he travelled here to celebrate the lauch of The Library, the first English-language edition of his work, published by Conundrum Press. Julie Delporte is a Montreal cartoonist and the author of the children's book Je suis un raton laveur and several books published by Colosse. She was here to launch Journal, published by Koyama Press and also her first work in English. Chihoi started off the night by showing us some of the Hong Kong comics that were popular when he was young: they were very violent, sometimes pornographic, and often associated with gangster culture, though the authors often sold millions of copies. By Chihoi's teen years, though, this style had diminished in popularity. Chihoi also related a moving account of the relationships he formed with other artists in his youth, including a friend who passed away at an early age. The next part of Chihoi's story was about his struggle as an aspiring comics artist -- work was hard to come by, and like many others, he had to support himself with part-time retail jobs and commercial illustration, including a gig writing children's comics, from which he says he learned a lot. An indie comics scene did develop in Hong Kong, however, especially around the magazine Cockroach. Finally, Chihoi took us through some scenes from his haunting, surreal new book, The Library. During the question period, he admitted that he may have a fixation on staircases. Next, Julie Delporte took to the stage greeted by the cheers of a crowd of local friends and fans and gave us a very personal and intimate tour of her autobiographical comics. Journal chronicles a difficult breakup, and the artist’s residency at The Center for Cartoon Studies in White River Junction, Vermont. Revisting the events of her life was an emotional experience for her as well as for the audience, who were vocal in their support. The connection between Julie and her friends and fans was a warm and moving thing to witness. Love in the room! Come on in and get your copy! We have plenty of Chihoi`s The Library as well, many of them signed! We had a great crowd! And the signing table was mobbed! Thanks again to everyone who came out! We had a great turnout, but despite the crowd, it was one of the more personal and intimate gatherings we`ve had in a long time. 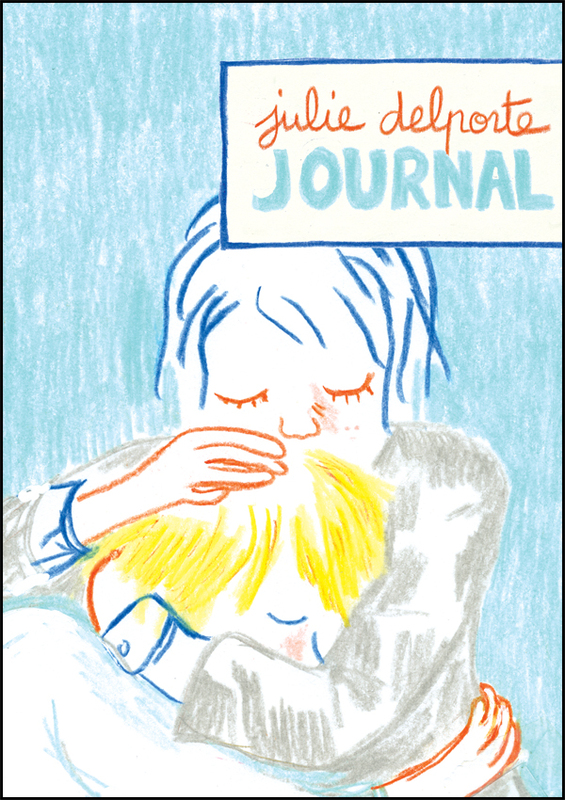 You can also look forward to a new book by Julie Delporte that will be published by Drawn & Quarterly next year! Julie is also the newest addition to our staff at 211, so come on in and say hi. If you ask nicely, she might autograph her book for you!